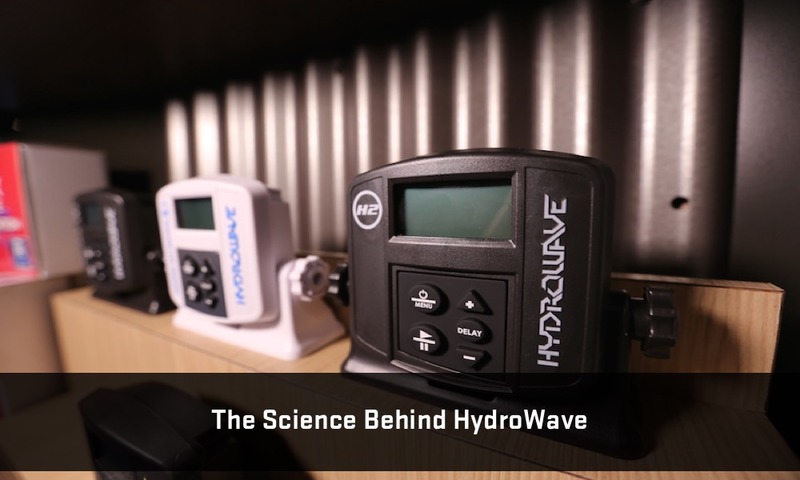 HydroWave sounds and sound wave patterns are based on years of scientific testing. Tactile Sound Transmission (TST) is the primary output of the HydroWave’s speaker system. Finely tuned amplifiers deliver the tactile sound. Tactile sound is different from ordinary sounds because it is sounds that you can actually feel. The concept is easy. If you have in earplugs you will not be able to hear people talking around you but you will feel the sound of a sub-woofer. Fish hear on that type of tactile level and frequency. The same frequency and sound produced by the HydroWave. HydroWave incorporates both Lateral Reactive Technology (LRT) and Vibration Reactive Technology (VRT) to elicit predatory feeding responses. LRT is a vibration wave technology that operates at a frequency level that stimulates a predatory response through a fish’s lateral line. As with any predator, fish are stimulated to the presence of prey. A fish is stimulated primarily through its lateral line. The lateral line is naturally tuned to detect low frequency (1 – 80 Cycles) vibrations created by small prey such as shad, herring, minnows, and others. 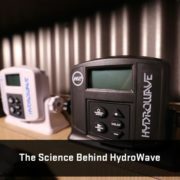 The Lateral Reactive Technology of the HydroWave produces these vibrations in patterns that create a predatory response. VRT is a vibration wave that operates at a frequency that stimulates a predatory response from fish through their inner ear. Contrary to popular belief, most fish do have ears. The fish ear is not like the human ear. Instead of funneling sound like a human, a fish ear consists of dense bones under the skin that detects and translate vibration. This vibration detection is so accurate that a bass is completely able to differentiate between vibrations of prey and other sources. This explains the reason behind how blind and visually impaired fish are able to continue to feed. The bottom line is that natural vibrations will elicit feeding responses from predatory fish where unnatural vibrations will not. The vibration patterns are that of natural sources of prey. Minnow’s, shad, herring and schooling bass fry are the primary vibration patterns. Other vibration patterns resemble water displacement associated with feeding or schooling fish. This pattern is most important in stimulating the competitive nature of the fish along with the instinctual schooling signals. Sound travels further and faster in water than it does in the air, about 4.4 times as fast which is the equivalent of 5000 feet per second. This speed combined with the poor visibility characteristics of water is the reason that a fish is so dependent on vibration and water displacement through TST’s for the location of prey. Most bodies of water are cluttered with sounds from outboard engines, swimming and recreational activity to the construction of boathouses. The source of sound clutter is always present. This forms the basis of how fish have developed keen senses that allow them to specifically identify clutter from prey and feeding activities of other fish. 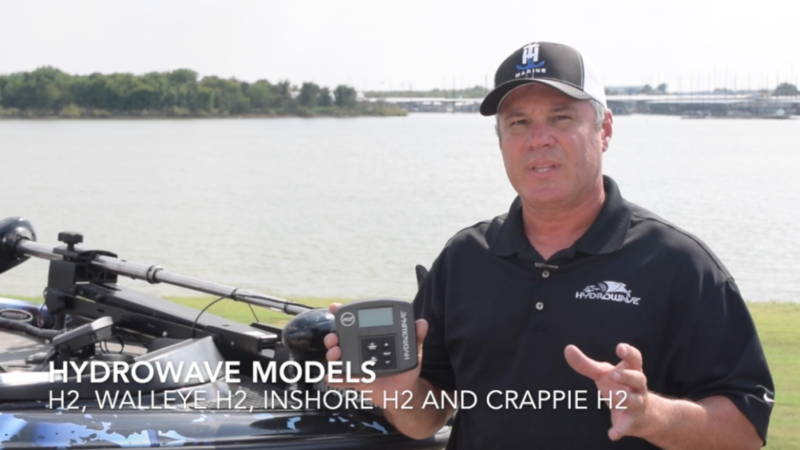 With sound representing the key component for identification of a sound source in fish, it is important for us to understand some basic elements of sound transmission. Many things can affect the speed of sound, including not only the nature of the medium, (gas, liquid or solid) but also its temperature and any other additive substances, such as water salinity. Basically sound travels faster through denser and hotter materials. As in a human, fish produce sound and vibration in two main ways, intentionally and unintentionally. Unintentional sounds are constantly being produced, mostly by swimming and feeding. However, they make a far greater variety of sound intentionally. Fish communicate with other fish for a variety of reasons such as schooling activity, mating activities, scaring intruders away, alerting of prey, alerting other fish of predators and so on. These sounds are universally similar and not very complex. Scientists describe them as grunts, scrapes, knocks, clicks, squeaks, groans, booms, thumps, rumbles and drumming. Nearly all the species studied so far produce their sounds using their teeth, swim bladder or a combination of both. Species that produce sounds using their swim bladder usually have special muscles attached to it for exactly this purpose. Fish try to take advantage of the sounds other species make. 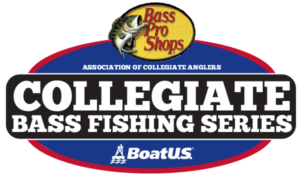 Thus some Bass will use sound to help them locate their prey while some smaller fish can detect the sounds larger predators make in their hunting. These sounds can be detected from great distances. Fish hear and sense movement in the water with both their “ears” and with the area that connects their body to their tail called the Lateral Line – see illustration. The Lateral Line is a sensory organ consisting of fluid-filled sacs with hair like sensory apparatus that are open to the water through a series of pores (creating a line along the side of the fish). The lateral line primarily senses water currents and pressure, and movement in the water. Fish hear with their ears or Otoliths, commonly known as “earstones”. Although similar to ours in their basic functionality are missing both the pinna (earlobe) and the middle ear with its eustachian tube. The inner ear, which is responsible for both hearing and balance, is located behind the eye. The modern fish’s ear consists of 3 chambers called the ‘utriculus’, the ‘sacculus’, and the ‘lagena’. The utriculus and the 3 semi-circular canals associated with it is entirely concerned with balance. The three semi-circular canals are arranged in three different planes of orientation, just as in the mammalian ear, one horizontal and two vertical, but at right angles to each other. These canals, which are sometimes collectively called the Labyrinth, have a bulbous area at each end called the ampulla. These ampullae each contain the cupula. Movement of the fish’s body, in any plane, causes movement of the fluid inside the canals. The movement of the fluid causes the cupulae to move when the cupulae move they press against sensitive hairs, which in turn send electric impulses to the animal’s brain. The ‘utriculus’, the ‘sacculus’, and the ‘lagena’ each contain an ‘otolith’ or ear-stone. This is normally calcareous and therefore much denser than the lymph fluid that fills the chambers or even the fish’s flesh. Movement in the lymph fluid within the chambers, caused by sound waves, causes the otolith to impact against sets of sensitive hairs within the chambers, which then also send messages to the fish’s brain. Expressed again in slightly different way, the otoliths hang in their chamber of fluid, passing sound waves cause the molecules of the water to oscillate, the exact movement is dependant on amplitude and wavelength of the sound waves, this movement of the water molecules causes the fish to rock back and forth in the water a little and because the otoliths are denser than the lymph fluid they move less and or more slowly and thus impact on the sensitive hairs.